Mary Lake Thompson Hand-painted Needlepoint Canvas. Rabbit With Bees is an adorable bunny rabbit holding a bee skep. Includes stitch guide by Carolyn Hedge Baird. Canvas size is approximately 12 x 15 inches. Design size is approximately 6 x 10 inches. Canvas is numbered MLT 201. It has lived in a smoke-free environment. 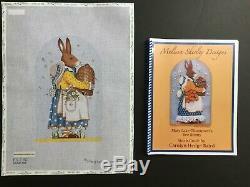 The item "Mary Lake Thompson Hand-painted Needlepoint Canvas Mrs. Rabbit With Bees/SG" is in sale since Tuesday, April 9, 2019. This item is in the category "Crafts\Needlecrafts & Yarn\Embroidery & Cross Stitch\Hand Embroidery Cloth & Canvas\Plastic Canvas".